Image caption Etihad say the safety and comfort of passengers is of "paramount importance"
An Australian plane passenger, who claims he suffered back pain after being seated next to an overweight man, is suing Etihad Airways. James Bassos says he had to contort his body to avoid contact with his fellow passenger during a 14-hour flight from the United Arab Emirates to Sydney. He said the journey resulted in a back injury and is claiming $227,000 (£106,000) in damages. Etihad insisted it would continue to oppose the case. "Mr Bassos will finally face a medical assessment in December 2015," the company said in a statement. "We believe that the matter will proceed to an early conclusion." Etihad had attempted to get the lawsuit, which was filed in 2012, thrown out of court. But a judge refused its request on Thursday and ordered Mr Bassos to undergo a medical assessment. The 38-year-old designer from Brisbane claimed he had to twist his body to avoid touching the "grossly overweight" passenger, who was encroaching on his seat. After five hours of pain and discomfort, he asked to be moved, but was told the flight was full, he said. He was eventually allowed to sit in a crew seat at the back of the aircraft, but had to return to his original spot for landing. 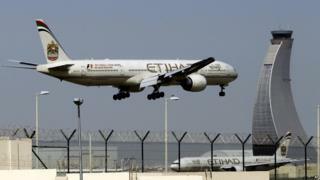 Etihad said it was common for customers to be seated next to overweight passengers on a fully booked flight. Mr Bassos claims he still suffers back pain and his sleep and concentration have been adversely affected. He is suing for medical expenses and loss of earnings.